“Pixels” is one of those movies that depends on its audience to remain aloof from logic in order for it to work on any level, because the screen is filled with so many moments of laziness and stupidity that no above average movie watcher (or video game fan, for that matter) is easily suckered. That creates a very awkward situation for its actors, all of whom occupy the screen like tradesmen who believed they have mastered a sales pitch; they enjoy what they are doing, and exhibit it in physical behavior of gargantuan enthusiasm. My question is, what do they think of what remains on the screen? In a script that clearly knows a thing or two about the gaming geek culture it hopes to emulate, one might deduce that someone – anyone! – involved would have the foresight to create a thorough scenario for something like this to pan out in. Alas, not even the movie’s skilled director, Chris Columbus, is able to make sense of this shapeless shell of cheap thrills, and like the very arcade games it references, the movie sweeps through grand gestures with little depth, ends abruptly and is easily forgotten after the time has run down. Allow me an opportunity to explain further. The film stars Adam Sandler, Kevin James and Josh Gad as childhood friends who first bonded at an arcade convention in 1982, where Brenner (Sandler) mastered many of the games in a championship but lost a first place title while playing Donkey Kong against an arrogant challenger (Peter Dinklage). That trauma has stuck with poor Brenner well into adulthood, and now he occupies his time by working as a technician installing TVs and surround sound systems for local residents in Washington D.C. That vocation allows him to stay in contact with both of his buddies: Cooper (the James character), who is President of the United States and has terrible approval ratings, and occasionally Ludlow (Gad), who spends most of his time alone obsessing over conspiracy theories in solitude (“JFK shot first!”). The three of them are brought back together, inevitably, but a discovery of monumental novelty. After an attack in Guam in which a military base is leveled (and left “pixelated”), Cooper brings in his old gaming buddies to investigate clues from surveillance footage. Members of the President’s cabinet dismiss the initiative as pathetic and insulting to military operation, but is it all that disposable? The evidence suggests that the attack patterns follow the exact same trajectory as enemy combatants followed in an arcade game from 1982, and that in turn inspires Brenner and Ludlow to do further digging, inevitably paving the way for a discovery in which an alien race has assumed that the footage from the gaming convention – sent into space as part of a time capsule – is a direct threat against them, and they have responded by, well, recreating those old games and sending them back to Earth in order to do battle against their very creators. In suggesting that the games were “recreated,” I am understating the actuality of the alien endeavor. Old characters from those games don’t just appear; they are full-fledged concoctions that seem to be made of pixelated light. That in turn creates tactical dilemmas for the U.S. government when it is forced to come up with the most suitable counter-offensive; the answer, a gun that emulates light energy, looks and feels like a manifestation of the same video game weapons used in a host of familiar endeavors. Perhaps it is no small irony, for example, that a recreation of “Centipede” will inevitably feature military personnel stationed on the ground of a field, where the giant monster preceded to attack from high in the sky (at least before it winds up crashing into a nearby hotel in order to join an old lady in a workout from TV). Or, in a cruder example, cars powered with light energy – and painted to look like ghosts – chase Pac-Man on a grid in New York City that makes it all look like an actual video game from overhead. The film progresses with these realities into a climax of overdone complexity, and in every case there is never a character who is able to pause long enough to contemplate the awe of it all; it’s as if their fights against such beings is all in a day’s work, like fighting terrorism or undermining fascist regimes. I sat and watched this unfold with momentary nostalgia, and then that was quickly replaced by disdain for a short-sighted vision. The writers, Tim Herlihy and Timothy Dowling, do not approach their material with any practicality; they see these figures – these famous digital relics from times long gone – as disposable weapons in a giant game of senseless warfare, and there comes a point where we begin to resent the cynicism of that initiative. If we are to assume, for the sake of argument, that old video games could be recreated in order to wage war against a populace, would they really be treated with such superficial significance? Here is a plot that is so passive about their arrival that it forgets who the entities really are: characters made famous by their own powerful presence in a computerized environment. To hear “Pixels” tell it, they must remain mindless in the agendas of unseen alien figures. What would have been the qualm, I argue, in taking things a step further? What if an invasion of this sort involved a Pac-Man that was devouring human resources, like oil or electricity? Or a centipede that was, say, a byproduct of some kind of government mutation, like Godzilla? Or better yet, a Donkey Kong that threw barrels at the White House because he wanted to overtake the Presidency? Even as vague suggestions, such scenarios inspire more thought than anything that this movie has fathomed in its final phase. Two moments do inspire notable laughs. One is a repeating plot device: each time the alien race makes a threat against Earth, it beams down a signal using old footage from the time capsule, and a foreign voice is laid over the dialogue to create the illusion that actual celebrities are the ones spouting the deadly warnings (one is done by Madonna, another by Hall and Oates). 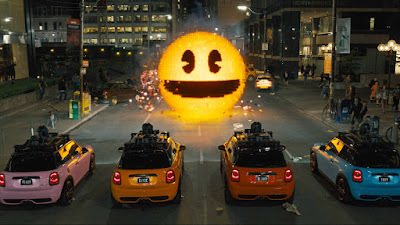 Later, when an attack comes to New York City in the form of Pac-Man, the movie brings in the game’s own inventor to participate in the fight, and both creator and son have a very amusing moment together before the action ramps up. In a more skillful endeavor, such details might have just been mere footnotes; here, they rise to memory because so little of what surrounds them is done with ambition. That is not to say that the very idea of “Pixels” is a bad one (contrary to my initial statement, even), but shouldn’t the concept have been stimulating enough to inspire the writers to think of their concept beyond a single pass? Was there even a second draft to this script, or did they feel (wrongfully) secure knowing that certain faces would be standing in the foreground to distract everyone from the dimwitted story progression? A great many things could happen in a film that involves video game characters coming to life and wreaking havoc on the free world, and here we wind up settling for scenes like watching a centipede storm through a hotel room just to mimic jazzercise.